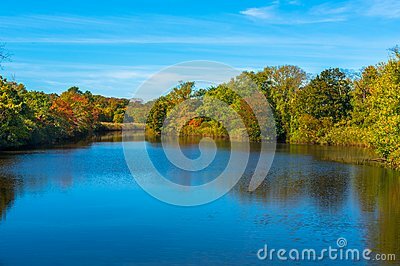 The trees surrounding Wreck Pond are turning colors as the seasons change in New Jersey, USA. Sunken wooden boat on the river or lake near the shore. Urban demolition construction site area with waste concrete stone and dirty pond in the sunset time with aqua blue sky. Old rusted ship in the middle of the pool.